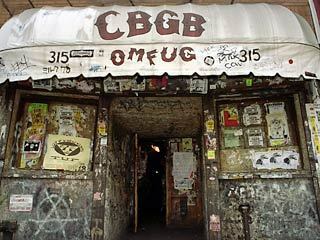 The East Village is often viewed as a younger, edgier sibling of Greenwich Village. A depiction that is accurate considering that the neighborhood is quite new as far as New York City neighborhoods are concerned. Throughout much of New York City’s history the area located east of 3rd Avenue between Houston and 14th Street was simply known as the Lower East Side. By the mid-20th century, however, the neighborhoods of the Lower East Side and Greenwich Village began to merge, and as boundaries changed the area’s population transformed as well. The term East Village first appeared in the early 1960s when artists from Greenwich Village started moving east to escape the rising cost of rent. This move to the Lower East Side was partly tied to the destruction of the Third Avenue El in 1956 that had served as a physical and social divide between the two neighborhoods. 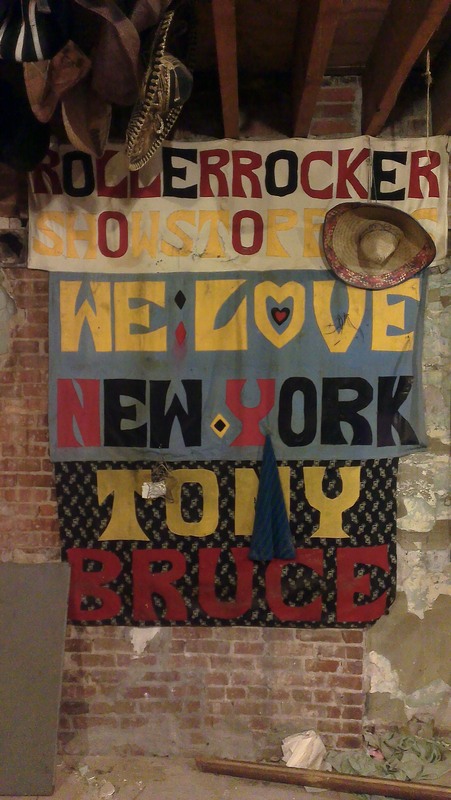 As the artist community spread east, real estate brokers followed closely behind hoping to cash in on the areas’ growing connection to the bohemian scene. Relators began referring to the neighborhood as “East of the Village” or the “Village East” and hippies began flocking to the area. Indeed, the first mention of the East Village in The New York Times came on Feb 7, 1960, and even at this early stage the article remarked upon real estate interests in the neighborhood. At the same time East Village had begun experiencing other serious demographic changes. The older immigrant community largely of Eastern European descent was being replaced by the city’s rapidly growing Puerto Rican population. Between 1940 and 1970 the city’s Puerto Rican population exploded, growing from a minority of about 100,000 to over a million. Many of the new immigrants settled in the Lower East Side, and by the time the hippies arrived there was a large Puerto Rican presence in the neighborhood. Through the influence of hippies, artists, and real estate agents the name East Village had become common among New Yorkers by the late 1960s. In a June 5, 1967 article titled “The 2 Worlds of the East Village” the Times pointed to the general acceptance of the term noting that the area had already “come to be known” as the East Village, but it also hinted that some New Yorkers were uneasy with the changes in the neighborhood. Referencing clash between city police and about 200 hippies, the article claimed that there was a large divide between the officers and residents of the “seething streets”. 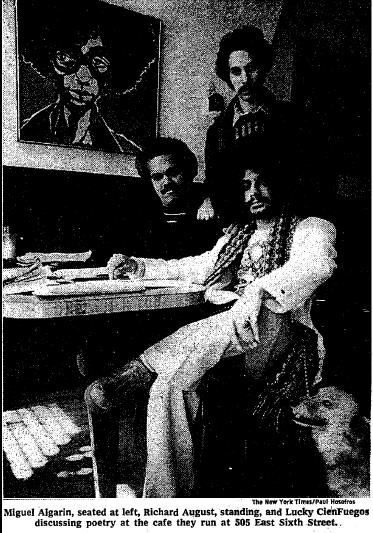 The author, which tellingly only interviewed police officers, declared that cops in their “trim, blue uniforms and highly polished shoes find it difficult to understand the world of the unkempt, long haired hippies, the Puerto Ricans with their strange language and customs, and the Negroes.” Indeed, for this author and the officers he interviewed, the residents of the East Village did not conform to what he called “middle-class society and values”. One of the officers described hippies saying, “You feel like vomiting,” while another complained of Puerto Ricans that they “like to congregate on the streets,” and “play their guitars at all hours of the night”. These descriptions did not represent everyone’s view of the East Village, but for the author and his clean-cut cops, the neighborhood seemed like an unfriendly place. Edmond J. Bartnett, “‘Village’ Spills Across 3D Ave.” New York Times, February 7, 1960: R1. 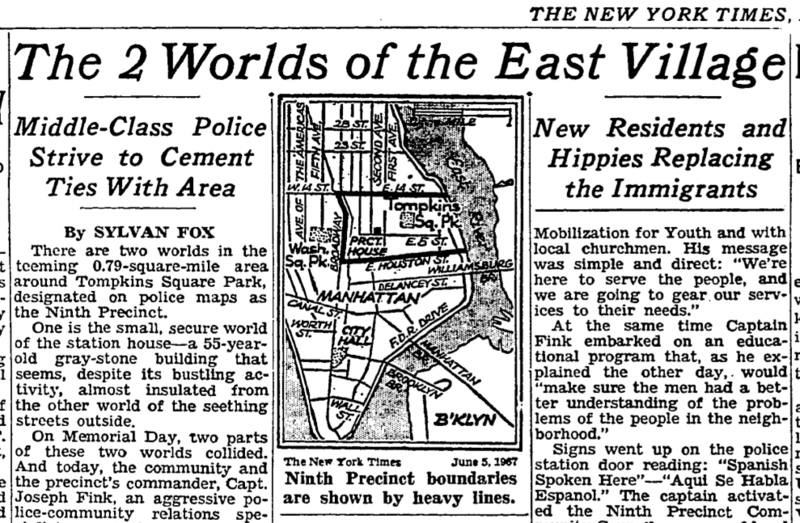 Sylvan Fox, “The 2 Worlds of the East Village,” New York Times, June 5, 1967: 63. Paul Hoffman, “Hippies’ Hangout Draws Tourists,” New York Times, June 5, 1967: 63. Ira Rosenwaike, Population History of New York City (Syracuse, NY: Syracuse University Press, 1972), 174. Photograph of interior of McSorley’s Old Ale House taken by Kerry Bridget Heimer, 2012. Prohibition faced strong opposition nationwide, particularly in major cities such as New York, and even more so upon the advent of the Great Depression. Bootleggers and speakeasies became commonplace, and there was simply not enough federal staff to adequately enforce the law. Many private bars continued operating with great discretion out of fear of facing raids; peephole doors were installed, protections were paid to local law enforcement and officials, and business continued for many in a stealthy manor. Bill McSorley the son of John McSorley and then owner of their family pub following John’s death in 1910, however, paid no mind to Prohibition. Being that many Tammany politicians and police officials were among the regular crowd of patrons at McSorley’s, immunity from raids did not need to be bought. An inconvenience was all it was to Bill McSorley, as Fidelio Brewery located on First Avenue, the place from which McSorley’s Ale came since its opening day in 1854, was forced to close. In the interest of staying open, and without a brewery to procure their ale from, “McSorley’s ale was produced mysteriously in rows of barrels and washtubs in the cellar by a retired brewer named Barney Kelley.” (Mitchell, pg. 10) It is said that Kelley’s ale was particularly strong leading Bill to take it upon himself to weaken the brew creating what he referred to as “near beer.” Somehow Bill’s generally surly attitude and shameless weakening of the ale at a time of increased prices (the rate for ale at McSorley’s during Prohibition was fifteen cents, or two mugs for a quarter, while over a decade later in 1941 it was sold for a dime a mug) still managed to amuse and draw the customers. McSorley’s blatant disregard for Prohibition even became the subject of major works of art. 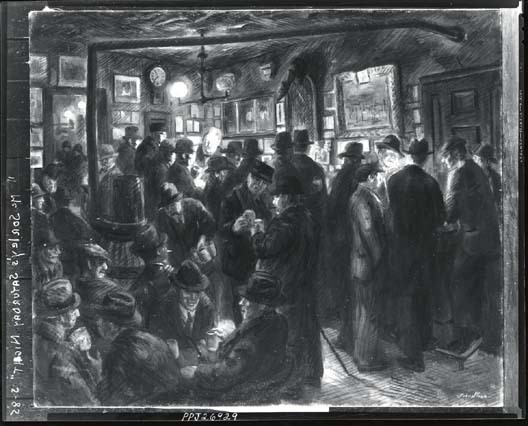 John Sloan, a member of the Ash Can School of art, a group who utilized their art as a means to depict the reality of their time, took inspiration from his visits to McSorley’s and created a series of five works illustrating the environment of the saloon. Two of these works specifically portrayed McSorley’s Old Ale House during the prohibition period, “McSorley’s Cats” painted in 1928 and “McSorley’s Saturday Night” painted in 1930. Each of these paintings speaks volumes of the continued patronage of McSorley’s as well as its “business as usual” mentality against the force of Prohibition. McSorley’s Saturday Night painted by John Sloan, 1930. Mitchell, Joseph. McSorley’s Wonderful Saloon. Pantheon Books, Random House, Inc., New York 1943. On the evening of February 2, 1913, a crowded audience enjoyed a moving picture show at the Houston Hippodrome, a movie theater in the East Village. During the movie a small fire erupted in the projection booth. 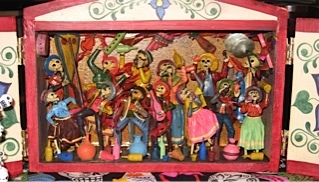 The fire was quickly put out, but not before it was noticed by members of the audience. A frightened boy in the balcony shouted “Fire!” and unintentionally started a panic that took the lives of two and injured many more. Headline about the Houston Hippodrome fire, New York Tribune, February 3, 1913, page 1. The Houston Hippodrome had been opened in December 1909, in a former Protestant Church at 141-143 East Houston Street. The proprietor, Charles Steiner, and his partners renovated the church to convert it into a theater, turning the pulpit into a stage and the organ loft into a projection booth, but retaining the wooden pews as seating for the audience. Though the building was not originally designed to be a movie theater, Steiner and company also made changes to meet all existing theater safety regulations, such as adding fire escapes and enlarging doorways. However, the Houston Hippodrome received citations from the Fire Department on multiple occasions for filling the theater beyond its mandated 299 person capacity. With the huge population in the Lower East Side at the time, it was easy to draw a large audience to enjoy moving picture shows and vaudeville acts. Charles Steiner, proprietor of the Houston Hippodrome. But the New York theater regulations did nothing to prevent the deadly 1913 panic. When the cry of “Fire!” was raised, the audience members rushed to the exits, ignoring or unable to hear the theater staff members’ attempts to calm the crowd. The patrons in the balconies hurried down the stairs, where some people fell and blocked the stairways. Those on the main floor rushed through the too small theater exits, which led out into the lobby that was full of patrons awaiting the next showing. As the doorways became clogged and people became more frightened, many lost their footing and were pushed and stomped. Two women were crushed to death in the confusion and 32 others were injured. Image of the Houston Hippodrome, New York Tribune, February 3, 1913, page 1. But the Houston Hippodrome panic did help persuade the city’s Board of Alderman to pass new legislation on theater regulation. The fire safety requirements were increased and the Houston Hippodrome underwent a $7000 renovation in the summer of 1913 to meet the new codes. The Hippodrome remained in operation until 1917, when it was demolished and a larger theater was built in its place. Today the Sunshine Cinema still welcomes audiences for movie showings in the space. The Sunshine Cinema today stands where the Houston Hippodrome once was. Ask any area resident about the cemetery in the East Village, and most will know it- “the one on Second.” What they may not realize, is that there are actually two cemeteries “on Second” in the East Village. They are the New York Marble Cemetery on Second Avenue, and the New York City Marble Cemetery on Second Street. Well, that isn’t confusing! The author visiting the New York Marble Cemetery. The New York Marble Cemetery was founded in 1830, and became functional in 1831. Civic legislation at the time prohibited burial directly in the ground below 14th Street, after a particularly virulent yellow fever epidemic. The solution was to inter the dead in underground marble vaults, large enough to hold a family group. The concept proved so popular that a second cemetery was established around the corner from the first, on a different “Second.” This unaffiliated location was named the New York City Marble Cemetery. 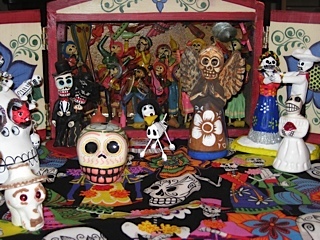 Despite being separate entities, the two cemeteries share much in common. Beyond the names, locations and time period, each cemetery was founded under very similar auspices. They are the first two non-sectarian cemeteries in New York City. Prior to 1830, burial grounds were owned and operated by a particular church, and membership in that church could be a prerequisite for purchasing a plot. As non-sectarian foundations, both of the marble cemeteries were unaffiliated with a specific church, and plot allocation was driven more by social capital than religious ties. These cemeteries were intended as “A Place of Internment for Gentlemen,” and the vaults were expensive. Starting at $250 in 1830, such a vault today would cost many thousands of dollars, not including accoutrements such as the headstone or even a casket. As the nineteenth century progressed, it became more popular for wealthy families to invest in elaborate burial plots at “rural” cemeteries, especially Green-Wood Cemetery in Brooklyn. At the same time, the social class for whom the marble cemeteries were built was moving further Uptown, and the East Village became a center of various immigrant communities. In the 1890s, there was pressure to close both cemeteries, move the remaining dead to other cemeteries, and re-purpose the land for community use. 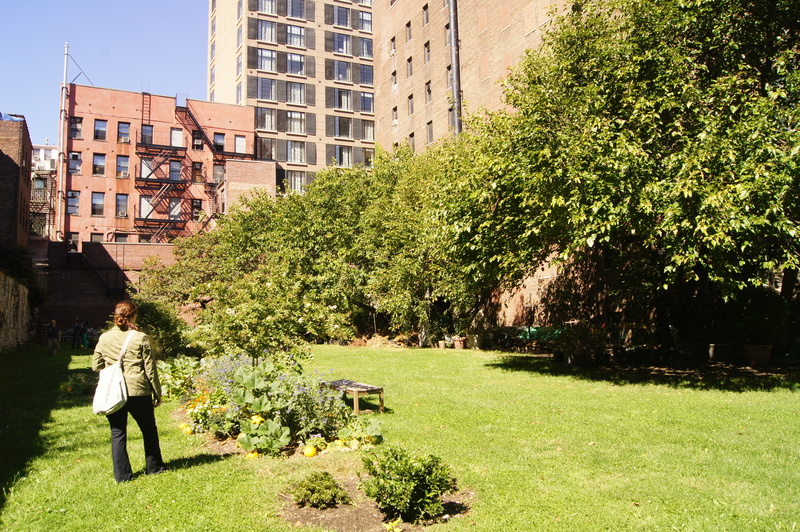 A playground was suggested for the New York Marble Cemetery site. In both cases, trustees and remaining vault owners were able to form committees and raise endowments for continued maintenance of each cemetery. The last internments occurred in 1937 at the New York Marble Cemetery and 1941 at the New York City Marble Cemetery, where remaining heirs were buried in family vaults. Through the twentieth century, preservation of the sites, and the deteriorating marble plaques and statues became of concern. Tuckahoe marble from Westchester County was used at each site, and the material is highly susceptible to weathering. The brick or stone wall surrounding each site also began to crumble. In 1969, the New York City Marble Cemetery was designated a “Landmark Site” by the New York City Landmarks Commission, and in 1980 the New York Marble Cemetery was placed on the National Register of Historic Places. With such recognition, each site was able to undertake repairs for preservation, which continue to this day. While the Marble Cemeteries are common sights “on Second,” neither is open to public access. They each hold a number of “Open Days” throughout the year, but generally remain locked behind their iron gates. This is a result of limited staff/ volunteers, even more limited funds, and the need to preserve the already-delicate sites. 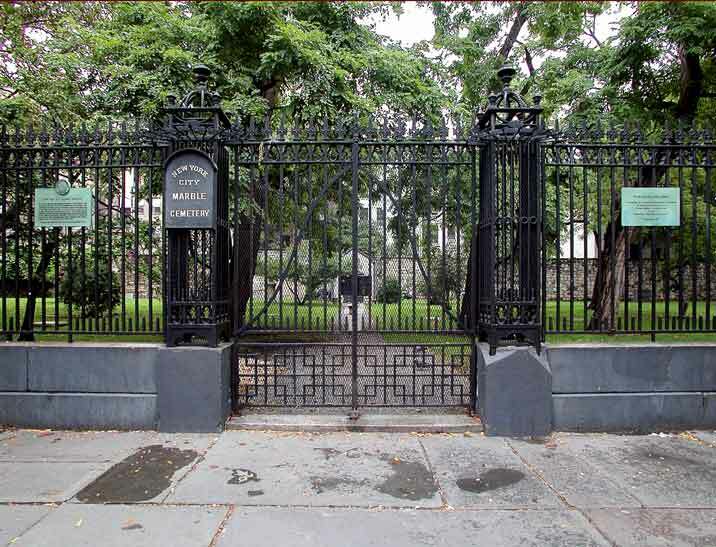 Historical records for the New York Marble Cemetery are available for view at the New-York Historical Society, while documents related to the New York City Marble Cemetery remain only in the hands of current trustees. For anyone interested in seeing each site, they will be open this weekend as part of Open House New York, October 6-7, 2012.